Your private Zambia and Botswana safari begins with a bang – right at the thundering Victoria Falls! In neighboring Chobe National Park discover huge herds of elephants frolic in a riverine landscape. 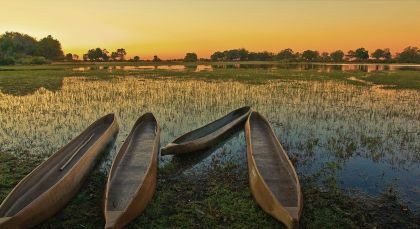 At the Okavango Delta, a fascinating ecosystem awaits you; discover the magic and mystery on traditional dugout canoes, gliding silently past diverse wildlife. Explore the island while on an adventurous sunrise boat ride. Cruise through the narrow channels of the Zambezi River. Learn its evolution from a traditional African sacrificial site to a modern protected World Heritage Site. Have a packed picnic lunch as you enjoy the vast scenic views and the splendor of the Victoria Falls. Brave enough for a river swim? Take a dip into the cool waters at one of the bathing pools. 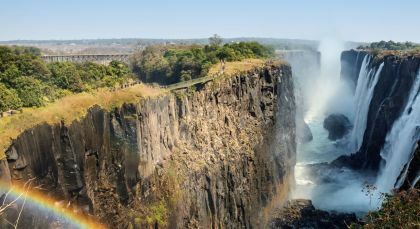 Explore the Victoria Falls from the Zimbabwe side walking through vast rain forests of rich flora and fauna. Encountering elephants, impalas, giraffes, buffaloes, zebras and indigenous birds add to the exciting adventures. Take walking or biking safaris to the Nakatindi village and indulge in an array of traditional delicacies, music, dance and a rich culture. Choose from a plethora of fun and adventurous activities at the Sanctuary Chief’s Camp, Botswana. Experience thrilling encounters with wildlife in their natural habitats by choosing the morning or afternoon game drives led by professional local guides. Ride in open-top 4×4 vehicles to witness fierce lions hunting prey such as zebras or antelopes in their natural habitat. Fortunate guests can also spot wild dogs that are almost extinct in other areas. Or, take the day off and opt for relaxing and authentic African spa treatments instead. 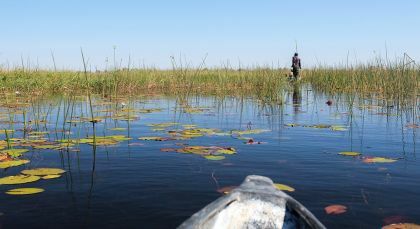 In June, you can also enjoy peaceful mokoro excursions in the lagoons and streams of the Okavango Delta. Mokoros, or local dugout canoes, gently take you through serene waters and offer a unique and soothing experience. 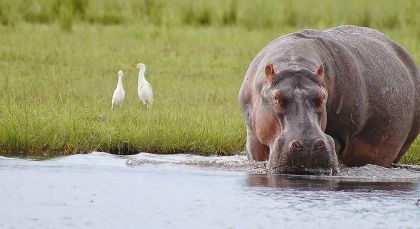 Spot hippos, crocodiles or antelopes and enjoy a distinctly African perspective of the Delta. You can also choose to enjoy panoramic landscapes on hour-long helicopter rides over the Delta for an additional charge.